I am against recent troop worship and irrational pseudo-nationalist mindset shown by PTI but I wish good luck to my friends who are taking part in anti-rigging protests today. I also condemn Punjab government and PMLN for blocking areas and using harassment as a tool to stop protesters. Almost everyone know what happened in 2013 elections. 11 May 2013 elections were a mockery of everything we know about proper elections. It was another establishment drama played with the help of feudal-corporatist political elite. Some sections of media and judiciary to some extent also failed to respond properly towards the rigging. Protests are also part of democracy and a sign of a living society. Using tax payer’s money to forcefully stop protesters is a sign of a tyrant government. Nawaz Sharif and his Mughal emperor type attitude is not going to do any good for the country. I hope things will be good for the people of Pakistan in future. Pakistan Elections 2013:Vote for Change, Vote for PTI and Vote for Bat! Need Change: Zardari and Nawaz Sharif are two big symbols of this political system. People need tos ee who is sticking with them as allies and who is taking a stand against them. People need to come out for a change and vote for Naya Pakistan and Vote4PTI. Reject these NRO and IJI-2(10 Party alliance) gangs. People standing up above their prejudices: I am glad that some of my strongly religious friends who belonged to Shia sect are now not following Sajid Naqvi and others who are supporting PPP and MQM but they are now supporting PTI. Similarly some of my Deobandi friends have stopped blindly following their brand of sectarianism and instead of following Fazl ur Rehman type, they will now give votes to PTI. Similar is the case with some Barelvi friends. This is change as its not just feudalism and extortion mafias which are exploiting people. These fake fatwa factories are also exploiting the sectarian diversity and using it to strengthen their political and financial positions. In sha Allah PTI will get the chance and deliver good for the people and the country. Military operations by PPP and PMLN governments were the reasons behind the start of ethnic violence as it provided more sympathies to MQM. ANP,PPP and MQM are major responsible of recent mess in Karachi. PMLN was ally of PPP in center when PPP took power in 2008 and they remained allies for a long time in Punjab. Bot PPP and PMLN avoided local bodies elections in last 5 years so one can get the idea what Karachiites should do? MQM and JI are not major parties and they only work as proxies of PPP and PMLN respectively. PTI will be in a position to take independent position on the issues. For IK haters: The thing is simple, whatever IK does and whatever social class background he has, he stands up above his social class prejudices of Mr/Mullah, Shia/Sunni,Muslim/Non-muslim or ethnic ones and supports justice and prosperity for all. This thing is lacking in so called religious and so called liberals of Pakistan a lot. Comment on IK’s speech in grand finale of PTI 2013 election campaign: I am glad that Imran Khan thanked people from all school of thoughts for praying for his health. Apart from many other reasons, I support Imran Khan mainly because he stands up above from his sectarian and social class prejudices and works for justice for all whether shia or sunni, whether muslim or non-muslim, mr or mullah, poor or rich and treats them like human beings. This is something which is lacking in fake liberal and fake religious parties. 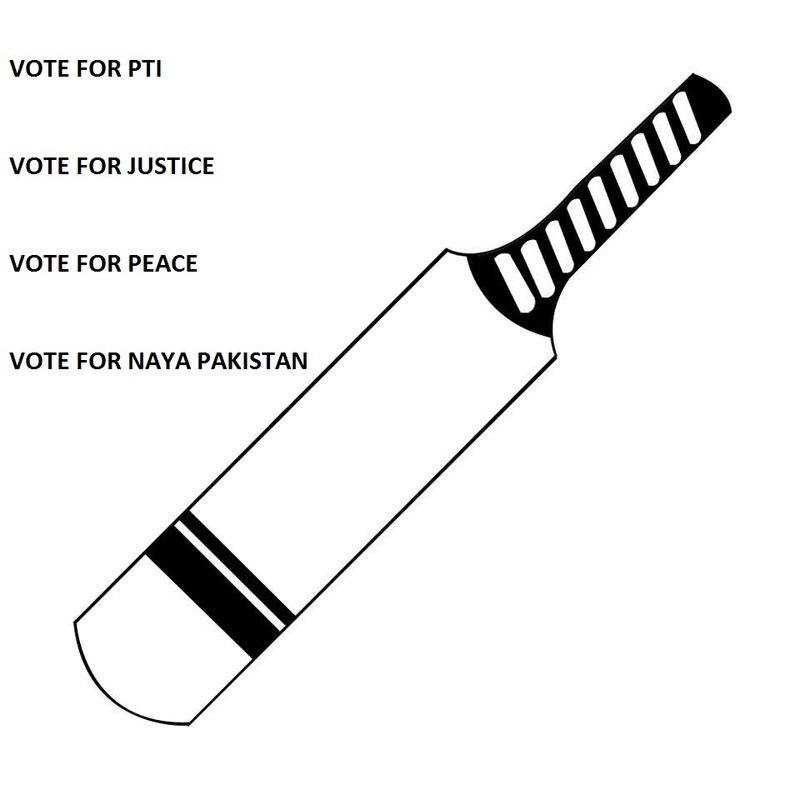 My vote is for Justice and My vote is for BAT! JI/PTI: Will the fundamentals be compromised over tactical politics? Recent wave of Arab spring and success of Justice and Development Party in Turkey have given many lessons to Islamic movements and political parties around the world. These revolutions and political successes came as a result of patient and hard laboured struggles without compromising on fundamental issues. Here in Pakistan, after wasting a decade in an un-wanted foreign war, there was a chance of smaller but ideologically focused parties to join hands against the so called war on terror. The other fundamental issues which got spot light during that time were issues like independent judiciary,corruption, missing persons and breaking the status-quo in Pakistani politics. Two political forces, Pakistan Tehreek-e-Insaf led by Imran Khan and Jamat e Islami led by Munawwar Hassan, can be expected to bring people together on fundamental issues related to the survival of our country. On one hand eyebrows are being raised over the inclusion of former PML-Q members in PTI and their alleged soft corner for MQM which Imran Khan has rejected. PTI’s poltical leadership has been denying the impression that they are forming any alliance with forces of status-quo, MQM with its politics of violence or any corrupt leadership. Their point of view on the inclusion of new leadership as expressed by Imran Khan recently is that these people are joining PTI after agreeing with PTI’s agenda and knowing that their assets and credibility will be scruitinized before giving them any party tickets. Time will tell if PTI sticks to what it claims. Now in another turn of events Jamat e Islami is getting closer with PML-N, a force well-known for being an important part of status-quo along with two other pillars including PPP and establishment. This line of argument is interesting from Jamat e Islami’s senior leader. JI is criticizing PTI for including those who are joining the party after accepting PTI’s agenda on USA war on terror, corruption,judiciary etc. Also these people are joining PTI after knowing the fact that their assets and credibility will be scruitinized before giving them party tickets. On the other hand JI prefers to be partners with a party which is itself an important part of status-quo and has a good history of corrupt power politics (JI’s past statements are also there on this). It was evident from the JI’s recent social media campaign that the people in JI who support PML-N and JUI-F are not happy with PTI’s growing popularity and a possible conflict of interest in the form of some common vote bank or supporter base especially anti-war on terror votebank. If we talk about fundamentals, PML-N supported operations in Sawat and tribal areas, and played its double role in judiciary movement. Also the possibility of them having a clear stance on corruption is very limited, if we look at their past tenures in federal government. But still they are eligible for being a partner in the eyes of JI’s senior leader despite former accusations by JI on PML-N for playing the role of a friendly opposition. So far there are no clear statements on the recent developments between PTI and JI relationship by their top most leaderships. According to news reports, they are expected to meet soon to discuss recent developments in Pakistani politics and way forward with each other. I hope they will keep fundamental issues like war on terror, corrution, indepndent judiciary, missing persons and independent foreign policy in mind before taking any major decision. This is a make or break time for Pakistani politics as new developments are taking place in neighbouring Afghanistan and a new wave of change in Pakistan is knocking our doors. Will PTI and JI compromise their fundamental stances over some tactical politics? Their answer may determine the future course of our country and its politics.